Man, was I ever excited when I saw that McDonald's Monopoly was back this year. Not so much to play it, mind you: I just had a blast looking at the Roll Up the Rim stats last year, and hoped I could do the same for Monopoly this year. Then I was pretty disappointed to realize that Business Insider had done its own analysis. I was all set to just read that contently—until I realized that they just copied and pasted the same article from last year. (Hint: The prizes changed this year.) The upshot: I get to do my own! (By the way, you can find the clinical breakdown of the stats in the official McDonald's rules, so feel free to check my sources as we go along). A total of 1,303,683,256 stamps were printed. McDonalds' claim that one in four purchases will result in an instant win is bang on then, which is nice. The reasons these numbers may not line up 100 percent (unfortunately) is that some of their prizes are listed for the U.S. only, and they haven't indicated the exact distribution for Canada. So one quarter of the time you buy anything, you'll win something. That's kinda nice. I mean, chances are it'll be medium fries (they're 50.2 percent of all food items, after all), but you could always hold out for that rare Royale with Cheese (you have a 2.2 percent chance any given time you go!). The other three quarters of the time, you'll get a property, and if you collect all in a property group, you win big! The problem is that McDonald's doesn't distribute their properties in an even manner, instead they distribute them in such a way as to give you hope. Each color group has a handful of very common properties (typically a 1 in 11 chance of getting them for any purchase), and one property that's very nearly impossible to get. For instance, McDonald's has printed off approximately 60,670,043 Baltic Avenue stamps, so the chance of getting at least one any time you play (remember, 2 stamps per play) is 9.09 percent. Those are pretty good odds - it won't take you very long to get yourself a Baltic Avenue stamp. They only printed off 1,000 Mediterranean Avenues though—so your odds of getting one of those any time you play are only 0.00015 percent. A wee bit tougher—and don't forget, that's only for the cheapest property prize ($50). Mediterranean Avenue: Need at least 451,666 plays to have a shot at getting... a $50 gift certificate! In the process you'll likely win about $170,000 worth of prizes, but it'll result in a net loss of $1,300,000. Maybe not worth it. Vermont Avenue: Need at least 112,955,548 plays, but you just might win gas for a year! Never mind the net loss of $316,000,000. Virginia Avenue: Better get ready for 90,364,438 hash browns (or equivalent), for your very own chance at $5,000! Fortunately, by that point you'll likely have had 4 million each of the other two properties for that group, so you're good to go! Tennessee Avenue: Pretty easy with only 1,895,651 plays needed, and you just might get a Samsung Galaxy! Fun fact: the caloric value of 1,895,651 hashbrowns is enough to feed you for about 415 years in a row. Kentucky Avenue: Enjoy the necessary 22,591,110 plays you're likely going to need to win your very own 5-night Delta Vacation for Two! If you got that in medium fountain drinks, it would fill five and a half Olympic swimming pools. Ventnor Avenue: Another relatively easy one - only about 6,024,296 plays for a 50 percent shot at nabbing a Beaches Resort Vacation for your family! If you bought all your plays with bacon clubhouse sandwiches, that would only cost you about $27,049,089. Boardwalk: Approximately 451,822,158 plays needed, but you'd have a glorious chance at nabbing A MILLION DOLLARS $817,572*! Even at the lowest rate of $1.00 per play for hashbrowns, this effort would require your Monopoly opponents to land on your Boardwalk 225,911 times (in original Monopoly, assuming you had a hotel there). Adding everything up, the total value of all prizes offered in Monopoly is $488,423,499.28. With a total of 651,841,628 plays, that means that the expected return of any given play is about $0.75. This may be pretty reasonable if you're buying $1 hashbrowns (get a hashbrown, plus an expected loss of only about 22 cents), but at an average eligible food item cost of $3.17, the loss to McDonald's on each purchase is about $2.42 or 64 percent, giving it a worse house edge than Lotto 6/49. 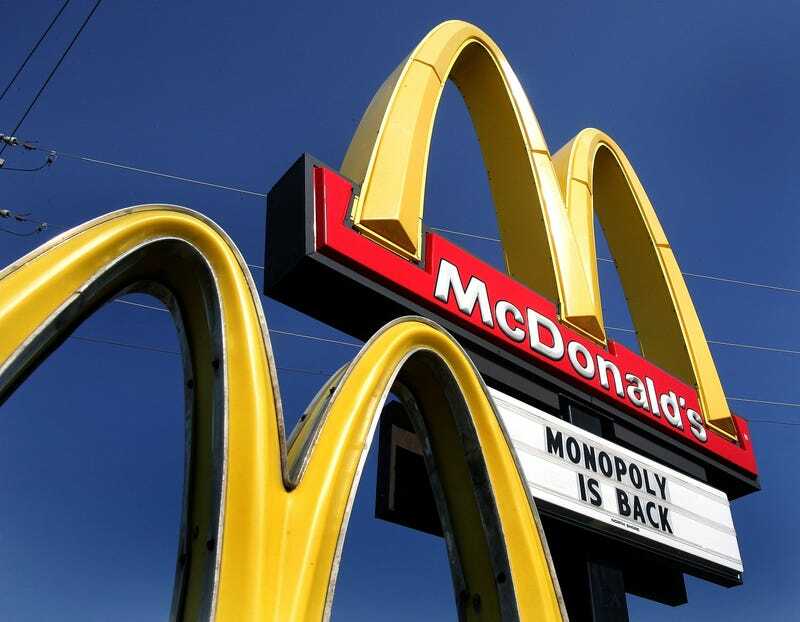 So, much like Tim Horton's Roll Up the Rim (or any large promotions, for that matter), I wouldn't recommend McDonald's Monopoly from an investment point of view. If you're already out there gobbling up hashbrowns, though, carry on! Originally posted to Extreme Enginerding. Republished with permission. Michael Ross is a structural engineer from Edmonton, Alberta, with an unnatural interest in logic puzzles, science, and trumpets. You can follow him on Twitter here.